Well, I am now a veteran of three half-marathons... how wild! This last one was quite the mixed bag. Here's a recap of this past Sunday's race, the Davis Stampede. The morning began dark and early at 5:30am. 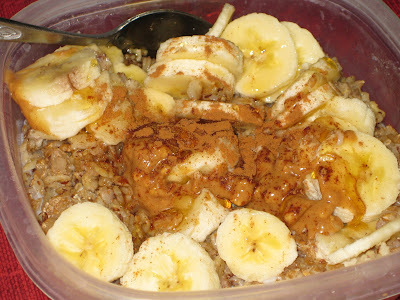 I rolled out of bed and tucked into some race fuel: a big bowl of 7-grain cereal, one banana, one tbsp organic chunky PB, one tbsp honey, and a sprinkle of cinnamon. Start out easy, don't burn out too early! Aim for a 9:00/mi average split. Pick up my tempo at mile 10. Sprint the last half mile. Finish the race in 2 hours or less! Given how I'd felt on my most recent training runs, I was a bit nervous my ability to stick to this plan, but I also considered that there's nothing wrong with trying my best - I might just surprise myself! After breakfast, I showered (to help me wake up) and dressed in the gear I had laid out the night before. 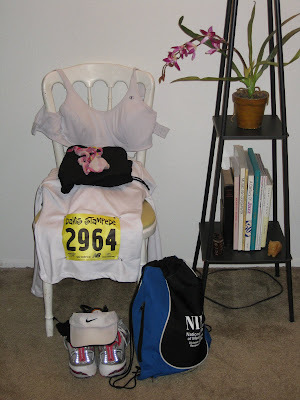 Don't be alarmed by the positioning of the sports bra - it needed to dry overnight. Packing some Gatorade, my iPod, a PowerBar, and flip flops, I headed out the door to pick up my race buddies, Emily, Renata, and Jin! After trolling for parking, we made our way to the starting grounds and checked our sweats. A few minutes before the gun, bubbling over with nervous energy, we lined up at the start. The "frontrunners," quite literally, waiting for the gun, hands on watch buttons. We all started at a much more reasonable place in line. Renata and I with Christine at the start. Emily and Jin with Mark and Christine. Jin and Emily ran together for most of the race, and Renata and I stayed together for the first nine miles. My race buddy and I started out at a pretty good pace, dodging around other runners for the first several hundred yards. The course for the first two miles was straight, flat, and wide, giving us space to settle into a rhythm. At mile 2, we were keeping exactly a 9 minute split (meaning that mile 2 must have been faster than mile 1, since we were shuffling somewhat slowly at the start). Yay, we were keeping our goal pace! Renata knew about a secret toilet at mile 2.5, which I took advantage of, having consumed probably too much Gatorade at the start. Renata graciously jogged in circles in the meantime. Well, that happiness lasted a few more miles. As we crossed an overpass at mile 6, my knee pain returned with a vengeance, but I pushed onward. And then, around the part of the course that passed by my apartment complex, I started to worry about needing a pit stop again. By mile 8, I was really not feeling well. [Reader Advisory: The following paragraph suffers from an acute case of TMI - read at your own risk.] 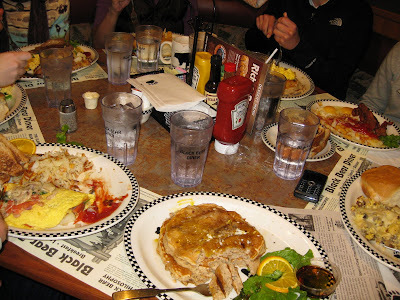 I've experienced digestion issues for pretty much my entire running "career," if you will. They're pretty common in distance runners, but doctors don't know exactly why these problems occur. Either way, as I approached mile 9, I knew that I needed to find a toilet, and fast. Off in the distance, in a ballpark next to the race course, like a beacon in the wilderness, I saw a public restroom! Unfortunately, I had to travel an extra 1/10 of a mile off of the course in order to reach the facilities, and then it took me a little while to feel up to running again. Long story short, this pit stop added around 4 minutes to my race time! Renata had continued on by herself, so I was on my own now for four more miles. Even though I had reached mile 9 at a strong slightly-sub-9:00/mi split, I was no longer optimistic about finishing the race in my goal time of two hours. As I settled back into my rhythm, I told myself, "If you want to have even a chance of finishing in your goal time, you need to to bust it out for the last four miles of this race! You should have nothing left at the finish line!! As Nike so succinctly puts it, JUST DO IT!!!" So, I put pedal to the metal. I was relieved that the last three miles of the course were total home turf - part of my usual running route and commuter bike path. Thusly, I had a really good sense of how far I had to go - and I knew I could make it! I rounded mile 12.5, a sweaty, gasping mess, and there were Mark and Shannon, who had come to cheer us on, staked out with camera ready! When the finish line was in sight, I opened all the stops and willed my legs to sprint down the chute! As I crossed the finish, my watch, which I had paused during pit stop #2, said 1:56:00! Meanwhile, I found Renata, who had finished about four minutes ahead of me, and watched Emily and Jin cross the finish line! I am so proud of all three of my race buddies for completing this race like strong, awesome runners!! 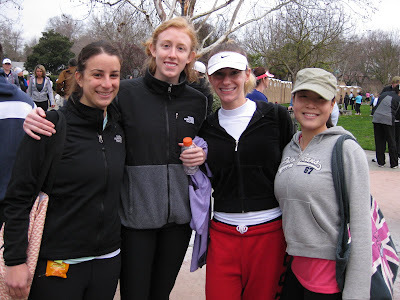 Student psychologists/half-marathoners :) Not pictured, the lovely Miss Renata. 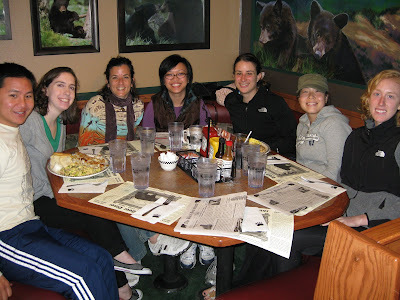 After grabbing some loot and cooling down around the starting grounds, we all met up with some more friends at the Black Bear Diner [the third mention of that restaurant in this blog - it's sheer coincidence, as those are three of about five times I have ever even been in there!] 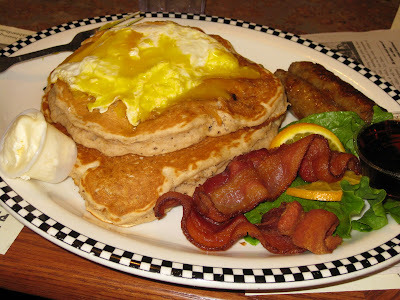 for a post-race feast! Mark, Shannon, Darlene, Maria, Emily, Jin, and Renata! 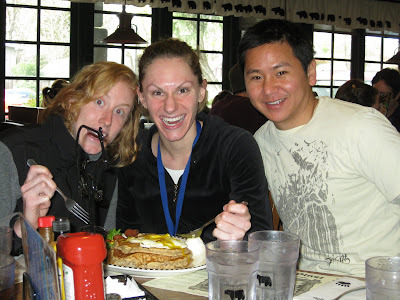 Hungry runners chow down. Mark, too. Later that afternoon, the official results were up. My gun time difference was actually 47.8 seconds, bringing my official finish time to 2:00:00.2!!! That's point-oh-two seconds above my goal time! Unbelievable. For the past few days, I've been deliberating on how to feel about this race. On the one hand, a 2-hr finish time was technically my goal, but, on the other hand, I was really hoping to come in below that goal. In my own mind/heart/whatever, I feel that I completed the distance in 1:56 - I actually ran those 13.1 miles at a very commendable 8:51/mi average split. Yay, go me! However, there is no denying that, at mile 9, I took a 4-minute "break" of sorts. This fact cannot be ignored. But, I am now of the mindset that, given my very necessary pit stop, as well as my injury, it is fantastic that I was able to clock in at 2 hours! Lastly, no matter what my time was, no matter what happened along the way, I completed my third half-marathon. I am a three-timer! And, before the year is out, I hope to run my fourth and fifth half-marathons! But those details are yet to come. Although I am a total novice, I recently posted about my commitment to becoming more involved with the sport of cycling, both to round out my fitness and assuage my overuse injury. I just equipped my bike with fancy clip-in pedals! And, what better way is there to build and grow as a cyclist than to train for a special bike ride?? So, on April 25, 2010, I will complete the Amgen Tour of California Stage 2 Breakaway Century Ride! A century is a 100-mile bike race, a major accomplishment for any cyclist - one might say it's the "marathon of cycling." This race is in the tradition of Gran Fondo, Italian for "Great Endurance," meaning that, while parts of the course will be timed, it is generally a friendly, more casual ride. Still, 100 miles in one day is no small feat! This will probably be the most challenging athletic event of my life thus far, and I only have 10 weeks to train for it! I will be riding to raise money for Breakaway from Cancer, and details about how you can contribute to helping me reach my fundraising goal will follow soon. My official century training plan starts next week - you can check out my plan here, and I will update it as the weeks until the race tick down. But until then, baby steps! Tomorrow morning, I will attempt my first clipped-in ride... So, wish me luck! Also tomorrow, I will receive my Valentine's Day gift from my truly wonderful Boyfriend [still working on a better pseudonym... perhaps "S.O." for "Significant Other"? I'll take suggestions]... I already know what it is, and it is positively the best, most perfect gift I could imagine! :-D!!!! Today's Question: Have you ever raced for charity? What was it like, and how was it different from non-philanthropic races? Did you find that fundraising made the challenge of the race even more meaningful? I may have said this already but i LOVE your blog. Gives me inspiration and I just enjoy your writing style. I'm running my first half in NYC in March and I get horrible digestion problems too when I run anything more then 6miles! I'm INSANELY nervous about it! eek! Good luck on your clipped-in ride!!!! Steph, thank you SO much. I like having a blog, but, since (as you well know) it takes time and effort, I wouldn't be motivated to keep it up if other people weren't getting something out of it. Your half will be awesome, I guarantee, and good luck with your training runs this week - you have a 10-miler coming up, right?? That's a huge milestone!!! For the race, I suggest keeping in mind where the toilets are located along the course. Don't worry about pausing to use them - you'll be much happier with the race overall if you aren't super uncomfortable (understatement) the last 7 miles. I want to hear about your V-day gift! My first half marathon last May was to raise money for the Leukemia & Lymphoma Society. I have to say - raising money definitely provided me with HUGE motivation to train because I felt I would be a complete failure if I didn't run the entire half marathon. Also - we had really fun training sessions on a weekly basis and I really looked forward to Saturday morning distance runs and I made some good friends in the process because we were all going through the same thing - pain from training and stress from fundraising. I highly recommend it. It was stressful at first when I didn't receive any money - but once the cash started rolling in I was inspired to run for those who supported me. I felt more motivated training for this half marathon than my other half marathon. I cried after finishing my L&LS half marathon because I felt that I truly accomplished something great. Good luck!